The benefits of increased CO2 levels within a greenhouse are widely accepted and understood, and often include earlier flowering, higher yields, improved stem strength, and larger flower size. This is because plants use the process of photosynthesis to convert water, sunlight, and CO2 into sugars and other materials essential to their growth and overall nutrition. When there is more CO2 in the air, plants become more efficient at absorbing it and processing it. Faster conversion of CO2 into sugars and nutrients results in faster plant growth. Additionally, plants take in CO2 through small pores on the underside of their leaves called stomata. When the levels of CO2 are higher, the plants do not need to open up these pores as often or as wide, resulting in less water loss and reduced likelihood of taking in damaging air pollutants. HOW DOES EZ CO2 WORK? 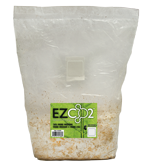 EZ CO2 houses a non-fruiting mycelial mass (fungus) and enough organic matter to sustain it for approximately 6-8 months. The fungus works opposite a normal plant: it breathes in oxygen and breathes out carbon dioxide (released 24 hours a day through the breather patch on the bag), essentially creating a natural, self-sustained, inexpensive CO2 generator. EZ CO2 is odor-free, produces no heat, and is already giving off CO2 as soon as you purchase it, there’s nothing to turn on or set up. Simply place the bag in your greenhouse and then leave it alone! 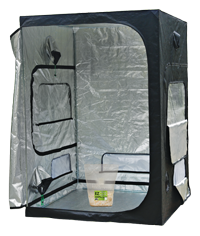 After purchasing EZ CO2, place it in your growing area (1 EZ CO2 bag is recommended per 4′ x 4′ area) slightly above plant height. CO2 is heavier than oxygen, and will fall downward onto the plants. That’s it! There’s no need to refill anything or make any adjustments. DO NOT REMOVE THE BREATHER PATCH ON THE BAG OR OPEN/PUNCTURE THE BAG IN ANY WAY. After approximately 6-8 months the CO2 production will gradually decrease, and your EZ CO2 will need to be replaced. When you are ready to dispose of your EZ CO2, you may open the bag and dispose of the contents in your compost pile or mix it with soil, and the plastic bag can be recycled.